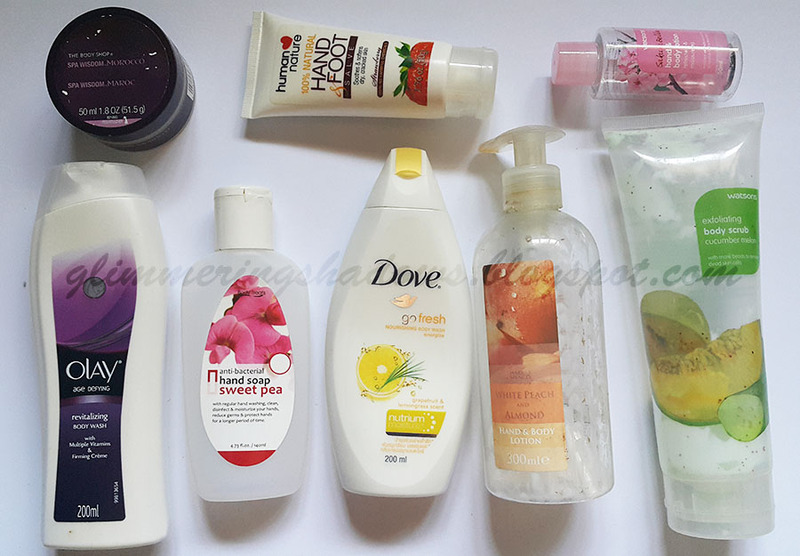 Continuing from where I left off with the last Empties post, here are the body products I was able to use up so far. 1. The Body Shop Spa Wisdom Morocco (Black Olive and Argan Oil Scrub) – I’ve had this for AGES. It was one of the first products I got from The Body Shop. I loved this product so much I avoided using it unless I had a special occasion. I have a love/hate relationship with the smell, but darn does this thing work well. No matter how many scrubs I’ve tried, nothing compares. 3. Watsons Sakura Bella Hand and Body Lotion – I didn’t like this much as the smell was faint and the consistency too watery for me. Won’t be repurchasing. 5. Body Treats Anti Bacterial Hand Soap (Sweet Pea) – This was a lovely smelling hand soap. The only thing I did not like about this was the packaging. I always prefer a pump for hand soap, rather than a normal bottle. I don’t want to have to hold the bottle; my hands are dirty! 6. Dove Go Fresh Nourishing Body Wash (Energize – Grapefruit & Lemongrass) – I had very high hopes for this product as it was from Dove and I really like their shampoo. I was disappointed to discover that I had to use a lot of product to make it lather well 🙁 The scent was very invigorating though. 8. Watsons Exfoliating Body Scrub (Cucumber Melon) – If I were to base my review of this on scent alone, this is awesome. It smells so refreshing and clean and urgh – I love it. As a scrub though, I don’t think it did much for me. I needed to use a lot of product to get a decent amount of scrubbies to scrub with (do you get me), so I ended up finishing this pretty quickly. I would buy this maybe just for my hands or something, but for a full body scrub I’d just go with Body Shop. Nice post. 🙂 With the Dove Body Wash I had the same experience.. I'm sorry to hear you had the same problem 🙁 It's so sad because I really wanted to like it haha.. I follow You#25, xoxo, follow back? Thank you so much sweetie! 🙂 Following you back now! Thank you so much for dropping by! I'd love for us to follow each other 🙂 I'll follow you now.